The biggest question after the 2016 election was if identity politics should be the focus of the 2018 and 2020 elections. This week will explore this question. Friday, September 28: Rocking the Vote (performance groups), Sundial and the Lawns, 4:00-8:00 p.m.
Monday, October 1: Voting Registration, Party Space, 12:00-2:00 p.m.
"Writers in Identity Politics", Gayatri Spivak, Party Space, 8:30-9:30 p.m.
Tuesday, October 2: "Conservatism in the Age of Trump", Lerner, 12:00-2:00 p.m.
Immigration Documentary, Roone Cinema, 8:00-11:00 p.m.
Wednesday, October 3: Voter Registration, Roone, 12:00-2:00 p.m.
"Identity Politics in the Classroom-Education, School to Prison Pipeline, Police and Incarceration", Roone, 7:30-9:00 p.m.
Thursday, October 4: Voter Registration, Cinema, 12:00-2:00 p.m. Identity Politics and the Electorate- Voter Suppression, “White Trash,” Dreamers and ELL, Susan Herman, President of the ACLU and Wendy Weisner, Brennan Center for Justice, Cinema, 6:00-7:30 p.m.
Friday, October 5: Political Art on Identity: fashion show, Dynasty George, Glo, Phluid Project, Irish Latina, Strange Fruit, Christian Joseph, Alexis Ifill, Roone, 8:00-10:00 p.m.
Saturday, October 6: Activist Brunch, Broadway Sky Lounge, 11:00 a.m.-2:00 p.m.
"Identity in Politics", LeShawn Warren, Wendy Davis, Roone, 6:00-8:00 p.m. The process is quick, intuitive, and free! Questions? Get answers with this great guide from Columbia's Office of Government and Community Affairs. Learn more about Voting Week, and learn more about the team of students behind it. Voting Week would not be possible without Columbia Student Engagement, also generously supported by the Department of Political Science and our other partners from across the Columbia campus. Don't forget to connect with us on Facebook, Twitter, and Instagram. Find your political community on campus! No matter what side of the aisle you find yourself on, find a political community for you here at Columbia. 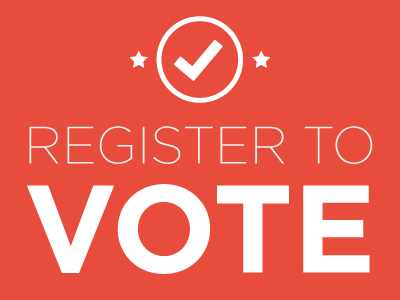 Register to vote, and file for your absentee ballot, right now with Columbia TurboVote. Questions or concerns? Get answers with this great guide from Columbia's Office of Government and Community Affairs.